The space shuttle Endeavour takes to the skies above California for its last-ever flight today (Sept. 21), giving observers from Sacramento to Los Angeles a one last chance to see a NASA shuttle soar through the air atop a jumbo jet. Endeavour's historic California aerial tour will cap a three-day trip from its homeport at NASA's Kennedy Space Center in Florida to Los Angeles, where the orbiter will ultimately become a museum showpiece at the California Science Center. The shuttle left Florida on Wednesday (Sept. 19) and made a stopover in Houston (home of NASA's Johnson Space Center, astronaut corps and mission control rooms) before completing its journey west. Today, Endeavour will begin its state-wide flyover with a takeoff from Edwards Air Force Base in Southern California at about 8:15 a.m. PDT (11:15 a.m. EDT/1515 GMT). The shuttle, riding piggyback on a modified Boeing 747 carrier aircraft, will make low flyovers over Edwards — home of NASA's first shuttle landings — and NASA's nearby Dryden Flight Research Center. NASA is also encouraging the public to share their shuttle Endeavour viewing experiences by posting messages and photos on the social networking website Twitter using the hashtags #spottheshuttle and #OV105. The latter tag refers to Endeavour's vehicle number designation. After leaving Dryden and Edwards Air Force Base, Endeavour and its Shuttle Carrier Aircraft will head north to make early-morning flyovers of Sacramento, California's capitol city. Then the shuttle will head to the Bay Area. NOTE: NASA officials warn that all times for Endeavour's ferry flight are weather dependent. So delays and possible changes to the plan are possible. NASA built Endeavour as a replacement for the orbiter lost in the tragic Challenger shuttle disaster of January 1986, which killed seven astronauts. 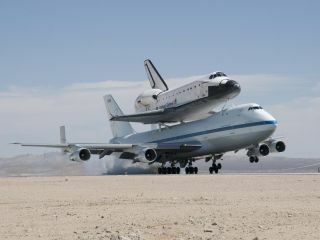 Endeavour made its first flight in 1992 and was retired in June 2011 after completing its final mission. In all, the shuttle launched 25 space missions and flew nearly 123 million miles during its spaceflight career. If you snap a photo of Endeavour ferry flight overhead, share your photos with SPACE.com and partner collectSPACE.com! Send in your snapshots of Endeavour atop its Shuttle Carrier Aircraft to SPACE.com managing editor Tariq Malik at tmalik@space.com and collectSPACE at contact@collectSPACE.com.